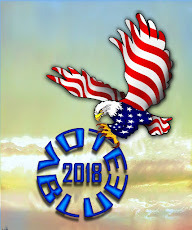 Kudos to Connect The Dots USA and we thank the site Administrator for allowing Connect posts on the TPI. Now as much as I love Medicare, the truth is only about 50% of it can be called an “earned benefit.” Most folks don’t realize that since Medicare’s inception, the payroll tax (2.9% for most workers; and recently 3.8% for high income over $200,000 single/$250,000 married) funds only the Part A hospital insurance portion. Thanks to provisions in the Affordable Care Act, the Part A trust fund was extended by 13 years so the program is projected to be able pay out full benefits until 2030. After that, if nothing is changed, the Part A payroll tax will only cover 86% of benefits. You can see from the most recent Trustees’ report that the Part B doctor/outpatient portion and especially the Part D prescription drug portion get most of their funding — a whopping $189 Billion and $58 Billion respectively in 2014 — from general tax revenues. That’s the same pot of money that funds other important priorities like education, infrastructure, defense and food stamps. For 95% of Medicare enrollees — those make less than $85,000 single or $170,000 married — the $105 Part B and average $35 Part D premium are calculated to cover only about 25% of the actual average per person cost. So the typical Medicare beneficiary is getting government “welfare” of the other 75% — about $460/month or $5,520/year — to cover the true cost of the premiums. Even high earners in the top means-tested tier with INCOME of $214,000 single/$428,000 married are still getting govt welfare to cover about 25% of the actual costs of Part B and Part D = about $160/month or $1,920/year. Why are we giving these very high earning seniors any govt assistance at all? While Part B and Part D are not earned benefits, the good news is they can never run short on money, as the Social Security or Medicare Part A trust fund can. By design, the programs will just keep pulling more money from general tax revenues to cover the annual costs. The bad news is, they will eat up an increasingly larger part of the overall budget if costs are not kept under control — rather like the Pentagon budget! In short, no one enrolled in Medicare has any moral high ground to criticize someone receiving food stamps, Medicaid or the Affordable Care Act subsidies. Nobody “paid in all their life” to Part B or Part D. Heck, the Part D program did not even exist until 2003, with benefits starting in 2006. Chew on that all you ungrateful, Medicare-loving, Tea Party hypocrites! 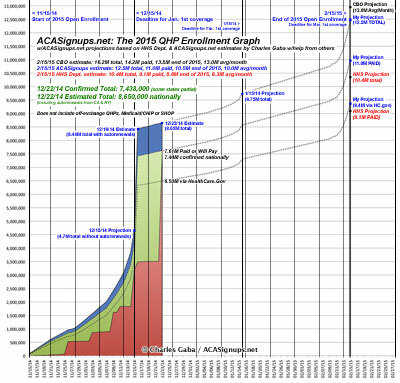 As the Affordable Care Act assimilates to US society and our social culture, we can rely on Charles Gaba's ACAsignups.net website for updates. Welcome back from vacation, Charles! 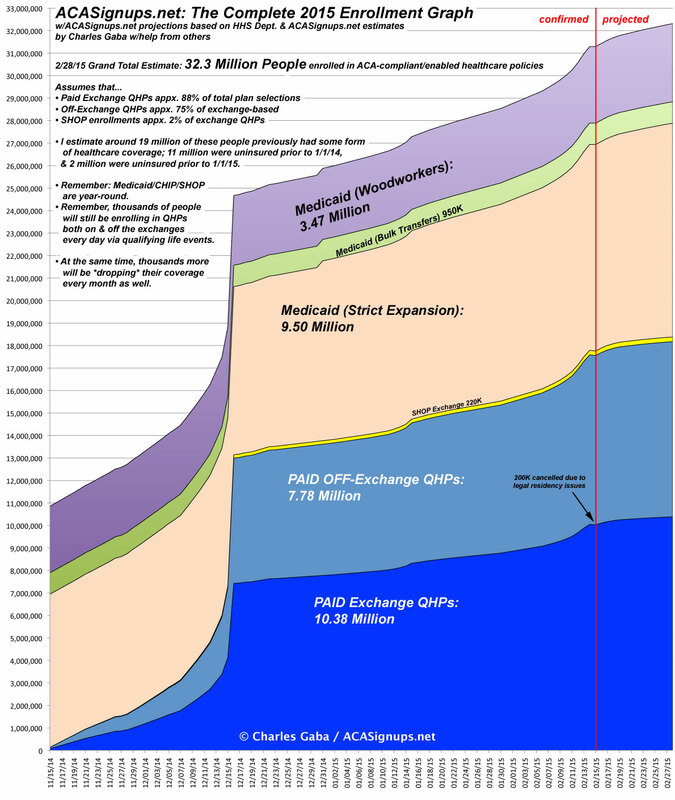 The 2015 enrollment "Big Chart"
However, now that every state (except for Idaho) has been updated through at least February 15th, here, once again, is the complete 2015 ACA enrollment graph, showing the rough breakout of all 32.3 million people whose current healthcare coverage is either wholly or partly due specifically to the Affordable Care Act. Again, that does not mean that all 32.3 million were uninsured to begin with. By my best estimates based on the available data, I estimate that around 19 million already had some form of insurance coverage. Around 11 million were uninsured prior to January 2014, and around another 2 million were uninsured prior to January 2015. UPDATE: Regarding the "Sub26ers" (19-25 year olds allowed to stay on their parents' policy thanks to the ACA): Many of these are already counted in other categories at this point. Many, however, are included in Employer Sponsored Insurance policies (not listed here). Unfortunately, this number was always very hard to pin down to begin with, and there were some policies in some states which already allowed 19-26ers to stay on their policies even before the ACA. As a result, this year I've completely abandoned trying to even keep track of it. However, they're definitely out there. I should also note that earlier today I posted a long-term projection which looks at how the rest of 2015 should play out...assuming that the Supreme Court DOESN'T gut HC.gov tax credits, that is.